Paris might be my favorite destination for a wedding, but it isn’t the only destination! Today, one of my fabulous celebrant colleagues, Rev. James Chun, Hawaii Wedding Minister & Celebrant, gives all the “insider tips” a couple needs for a perfect beach wedding in Hawaii. Couples are always thinking big when they start dreaming about their wedding destination. The idea of turning that destination wedding into a reality is sometimes easier than you would think, and having your wedding ceremony at great Hawaii beach is something that you’ll remember for the rest of your life. With some careful planning and a lot of happiness, the wedding of your dreams is definitely possible. You can have your wedding ceremony in Hawaii on the island of Oahu and you will get a spectacular and exciting event. Also, consider the different Hawaiian traditions that you may incorporation into your wedding. While some people think they can only have a wedding in their local home area. 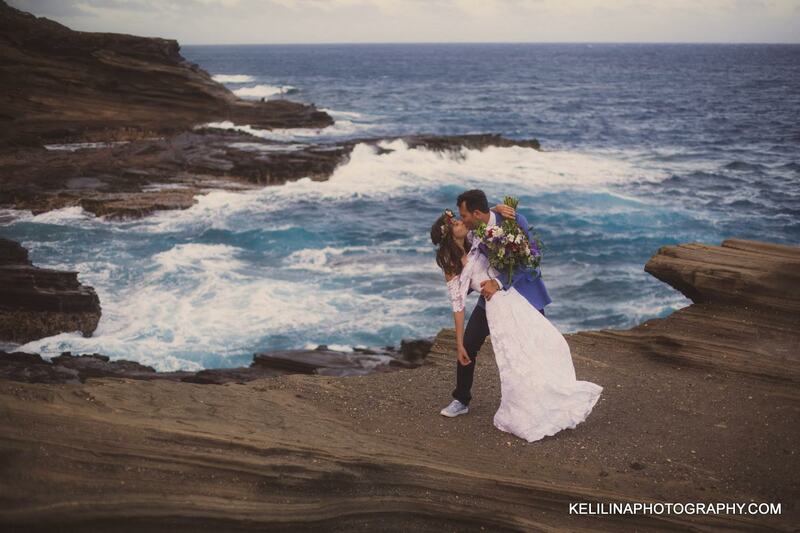 Every year there are thousands of people who organize and plan a destination wedding in Hawaii. Also, there are many people who understand how exciting the process can be, and get a first-hand experience of how special their wedding day really is, and the fun involved in traveling somewhere exotic to get married. While the idea of a Las Vegas elopement is typically the first thought to cross many people’s minds, the idea of Hawaii beach elopement is also very popular. With lots of beautiful resorts spread out across the Hawaii islands, especially on the island of Oahu, you are definitely going to find the perfect spot for your needs. You will also find the perfect dress, wedding ensemble and decorations to create the wedding of your dream. You don’t have to worry about lacking anything. If you’re thinking of having your wedding at a beach, then you are definitely going to consider the best location and Hawaii is one of the few places where you can have your dream wedding ceremony on the spectacular sand in the pacific ocean. Also, there are many great wedding planners and coordinators in the Hawaii area who can assist you with all of the small details that can disrupt your dream wedding. Getting the help of someone that is very familiar with the area can help to ensure that you know how much it is going to cost, what you will get from the ceremony and can make all of the decisions you need to actually enjoy your wedding day, rather than spend it finalizing your decisions. Beautiful scenery, fabulous and gorgeous beaches all await you in Hawaii and planning a great Hawaii beach elopement / wedding can be an ideal way to start your new marriage and bring a simple yet glamorous touch to your wedding for a much more conservative budget than you can imagine. Working with a good wedding officiant can help you save a lot of stress, and purchasing your airline tickets in advance can also lower some costs. You will be impressed and amazed at what a Hawaii beach wedding can really be with some advanced planning. Not all couple dream of having a flamboyant wedding. For some, they like the privacy or the spontaneity of eloping. These are some ideas on the ways to handle the distinctive aspects of an elopement. A true elopement is when a couple leaves their family and friends to get married all by themselves. Maybe they have known each other for some years, and they decide to get married by getting on a plane to Hawaii. Or maybe the groom and bride have had a brief but passionate whirlwind courtship and spontaneously decide to get married. What these types of elopements have in common is that they are spur of the moment, and above all, done without telling family or friends first. Nowadays, some couples don’t have any secret elopements and they will inform some close friends on their plans, and may even bring along a maid of honor, best man, and witnesses to their vows. What this type of elopement has in common is that the couple still keeps their big announcement till after the ceremony. However, there are still a group of people that know about this wedding ceremony. There are several reasons why a couple may decide to elope instead of having a traditional wedding. Freedom is absolutely one of the big reasons. Some couples may fear family objections, and decide to pre-empt them by marrying without seeking for the approval of their parents. There are also some couples, who have been planning a big wedding, but they found themselves overwhelmed by the enormity of it, and they decide to scrap the big production in favor of a small but meaningful ceremony that only involves the two of them. Whatever the reason for choosing to elope, there are things that you need to understand. A practical thing is to know about the laws of the state in which you plan to be wed. The reason is that in some iconic location for elopements they have different process that you need to follow. Rev. James Chun can easily help you with all this information. Therefore you don’t have to stress yourselves. One of the most attention-grabbing parts of eloping is the aftermath. You must be ready for the fact that some members of your family may be more shocked than overjoyed. And if you get married without informing your best friend, expect some hurt feelings may arise. Once everything is settled a bit, the couple may decide to host a small reception in honor of their marriage. This is one of the best ways to celebrate your marriage with those that you love. Eloping can be dramatic and fun, and it is definitely something that couples have been doing since the beginning of time. If you are thinking about going down this path, just make sure that you have taken enough time to reflect on what it means to be married. This will ensure that your heart is following your head, not the other way around. And if you do decide to elope, then elopement in Hawaii on the island of Oahu is the best place you can be. www.hawaiiweddingminister.com for more “insider tips” to plan the perfect beach wedding in Hawaii. But wait… You want to elope to Paris? Click here to get started.